There’s no mistaking the fact that mobility equipment is there to make your life easier. It helps you move around of course, but it also gives you a sense of independence as, in most cases, you can now rely on yourself to get where you need to be. We want to help foster this sense of freedom by offering a host of additional products and accessories to make your life even easier. An essential part of being independent is not having to ask others for help. This can sometimes be difficult when your wheelchair needs to traverse over rough terrain. That’s where the FreeWheel attachment comes in. Don’t let its unassuming looks fool you. It functionality relies on its simplicity. Even though it is lightweight, it is extremely durable and can even be used when hiking. If you have a rigid-frame wheelchair, all you need to do is attach the FreeWheel to the footrest and you’ll be ready to go. The clamp used for this attachment is engineered with the utmost safety in mind, allowing you to move around with confidence. 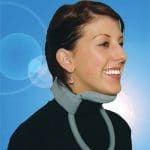 The importance of head- and neck support cannot be stressed enough. With these collars, the power is literally in your hands. This is because the material of the collar can be bent by hand, which allows it to fit perfectly to your neck and underneath your chin. Not only is this material malleable, but it is also covered in a light fabric that is easy to clean and comes in a range of colours. Even though this is a soft helmet, it offers a high level of protection to the wearer. It has the added benefit of being well ventilated to keep the head cool, which in turn keeps the wearer comfortable. These Meyland-Smith soft helmets can also be used by both children and adults. Wearers can choose between blue and red colours as well as a range of sizes. This is the ideal choice if you require a special needs helmet as you will get a high-quality and fully functional product which is extremely comfortable to wear for extended periods of time. While maneuvering, your own wheelchair may give you that sense of independence and freedom, but it can become tiring. Good Life Medical wants to ease your load a bit, which is why we think that our power assist wheelchair could be the ideal solution. Our Quickie Xtender was developed by Quickie and Yamaha and gives users an unbeatable experience when it comes to moving around quickly. If you have a manual wheelchair, this power assist product’s motorised rear wheels will get you moving up to four times faster. These power assist wheels will increase your manual wheelchair’s efficiency while possibly even improving your health. This is because with less physical pressure being applied by you on the handrim, the chances of wrist and shoulder injuries are drastically reduced. When using these power assist wheelchair wheels, you’ll be able to enjoy a faster, smoother, and overall easier ride. As you can see, we have a range of additional products that drastically improve your quality of life while keeping you safe. These products also increase your level of freedom, which is essential to your overall self-confidence. Our highly skilled team is on hand to talk you through all these options to help you make the right choice. Simply complete our online enquiry form and someone will get back to you. Alternatively, you can give us a call if you have any questions or queries. Good Life Medical would love to be a part of your journey to independence.